A scam targeting job-seekers in India | It's a Miracle! I’ve written about the Nigerian 419 scam before, but few know that India is now one of the largest exporters of counterfeit medicines to West Africa. As India becomes an economic superpower, there will invariably be a number of unscrupulous individuals who attempt to get rich quick by fraudulent means. Some of our con artists have set up elaborate schemes that are truly first-rate too. Recently, an acquaintance in India who has over five years experience in the financial sector, applied for a job advertised on one of the major online job search sites. He thought he was applying to Barclays Group in the United Kingdom, one of the world’s largest financial institutions. The job ad asked applicants to submit a resume, and once he did he received an offer letter. He thought it was odd that he had been given an offer letter without even having to interview, but he was soon elated with the salary mentioned in the offer letter. After he sat down and looked at the letter carefully, he felt the offer was too good to be true, so he shared with a couple of his friends, including me. I’m reproducing the offer letter along with some of the obvious warning signs with his permission and as a benefit to other potential job-seekers. I have no doubt that Barclays is unaware of the fraud committed in their good name, and I’m also refraining from mentioning where the job ad was posted, because it has subsequently been taken down at the request of concerned individuals. If you take a look at the letter, apart from the use of anachronistic phrases and grammatical errors common in South Asia (such as incorrect use of prepositions, unnecessary capitalization, and official-sounding mumbo-jumbo), the scammers have created, what at least at a cursory glance, looks like a real job offer. Plus, the fact that this letter was not unsolicited makes it somewhat reasonable, right? On further inspection, there are couple of immediate give-aways to the deception. First, I’ve never heard of a job offer that was not addressed to any particular individual. Had the scammers been more talented they would have personalized the fraudulent letter. In addition, it seems odd that there would be a document labeled “soft copy of your job offer document.” A real soft copy would be nothing more than a scanned or faxed version of a printed offer letter. But perhaps, the biggest loose end is the exorbitant salary being offered. It is simply too good to be true and a real job offer would only have matched prevailing wages in the City of London. A five year contract for a job paying 9,500 pounds per month, various allowances, free travel and amenities in the midst of global financial turmoil is ridiculous for an entry to mid-level position even if the person had been grilled in multiple interviews! 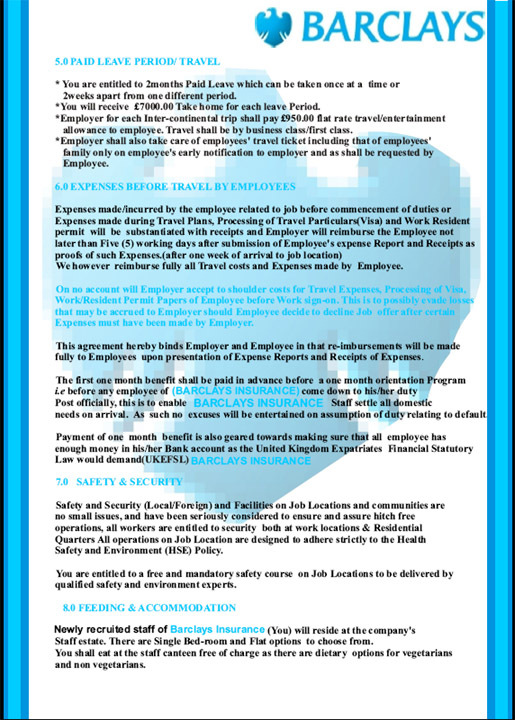 Notice also that there is actually no mention of duties to be performed, an actual description of the job, or the name of the manager who the applicant is to report to. Finally, a quick search reveals that there is no Dr. Murphy Fredrick listed with Barclays. So, if these fraudsters weren’t offering anyone a real job, how were they asking for money? This was where they showed a bit of sophistication. They set up a fake barclaysinsurance.co.cc website which looked a lot like the legitimate group.barclays.com website to allay fears. They subsequently took down the site after, what I a suspect was a successful conclusion to their operations. Their scam was intricate in that there was no actual mention of direct transfer of funds in the cover letter. What the fraudsters did was that they set up a website for a fictitious travel and immigration specialist called Charlton Chambers. This was not mentioned in the “offer letter” but in the accompanying email. 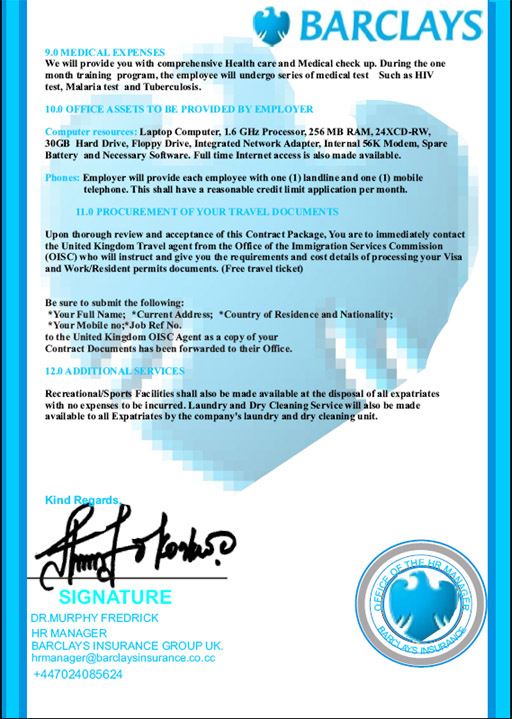 All transactions for visas and travel by successful candidates had to be handled by this company which had listed phone and fax numbers (+44-7024027790, 44-7024063929, 44-7024041676, 44-7960554113, 44-8704953788). Search for these numbers and you will find that they are associated with a number of other job offers, hinting at the widespread nature of this fraud. In any case, candidates were reassured that they would be reimbursed upon joining Barclays in the United Kingdom. I noticed that the website for this fictitious company went down in mid-July before a bulk of applicants were supposed to have joined. I am sure it has mushroomed elsewhere. This last step might seem like it needed a lot of work in order to siphon money from hapless jobseekers, but because of the indirectness of the approach it was also more likely to succeed with sophisticated, but desperate professionals. I hope people caught on to the scam. But I’m also wondering what other devious plan these fraudsters are currently hatching to prey on desi aspirations. 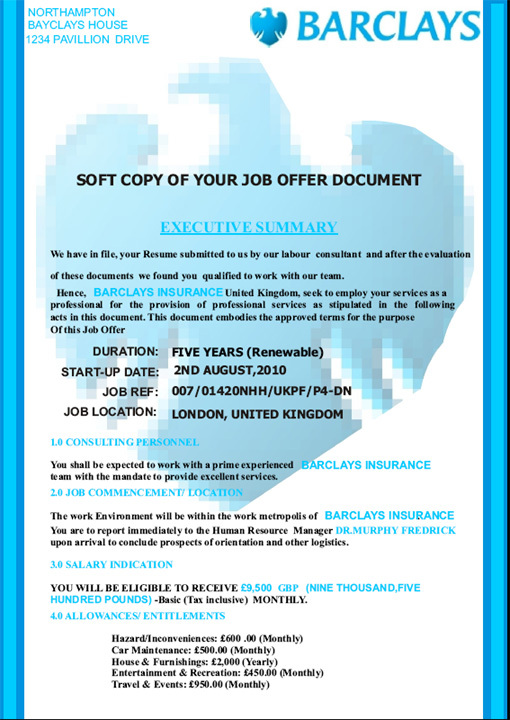 Footnote: Variations of this scam set up possibly by the same group or copycats send job offers on behalf of Vodafone, Pfizer, Standard Chartered Bank, Shell, “Hilton Hotel London”, Virgin Atlantic, Honda Motors, Marks and Spencer PLC, Gucci Company UK, The Bentley Hotel, Nissan Motors, Hyundai Motors UK, Hewlett Packard, and Qatar Airways London. This entry was posted in desi travails, godmen and fraudmen by Anirban. Bookmark the permalink. Great post! I think the inconsistent spacing in the letter is the biggest clue, yet “Charlton Chambers” is an exquisite name for an immigration specialist! That part of this scam is very well done! I wonder if the FBI would be interested in this scheme, probably they would. What is the equivalent of the FBI in the UK, because I’m sure they’d like the information too. On a side note, have you ever noticed the in the USA we use scam and scheme interchangeably, but in India and the UK, it seems scheme is used as a term to describe a legitimate business plan. These operatives use a number of websites apart from Charlton Chambers such as Carlton Chambers (the name of an Olympic gold medalist), Rowland Chambers, Hoffman Chambers, Ali Chambers, and Barton Chambers all with the same telephone numbers. The common denominator here is “Chambers” and they can constantly register websites until they run out of regal sounding surnames. Google Maps street-view pulls up a street with a couple of stone-buildings none of which have any signs. In any case, I’ve formatted a fake resume and will bait them if I get any fresh leads. India definitely has a problem with counterfeit medicines, however, in the case of west africa it is not, I repeat, India is not the one who is selling the counterfeit medicines. Chaina deliberately selling it under ”Made in India” tag . You may want to refer the following link http://www.deccanherald.com/content/58228/india-africa-check-fake-drug.html, good your educating and brining awareness about different kind of threats, but it is sad that you’re not aware of Chaina’s Made in India counterfeit medicines sold in west africa! I would ask you to do a basic home work before you place the blame on a nation! I’ve fixed the link. Thanks for sharing. That is a tangential point in my post about a specific scam. Regarding fake drugs, closer to home, it is estimated that approximately 15% of drugs in India are counterfeit. As you mention, this is a real problem too. When I wrote that a substantial portion of counterfeit drugs in West Africa originated in India, I did not “place the blame on a nation”, I used it as a counterpoint to the scams originating in Africa which cannot be blamed on nations either. Having said that, it is fairly easy to track country of origin, so if there is a concerted effort by individuals in China as indicated in the link that you posted then this can be thwarted too. But the broader point is that there are serious problems. Thanks for putting this up. A relative almost got taken in by a similar offer. I have the copy of the letter and again, it sounded too good to be true (This time from Shell, in London…ironic if it means a shell company, haha). But I advised him to call the numbers on the letter and send out emails. Needless to say his “conversation” with the office was very suspicious and we dismissed it as a fraud. I’ve been meaning to write about this for some time now. My friend, who has a stable well-paying job in India, also almost got duped. I don’t have much of a PageRank, but I’ll keep posting any information on this and other frauds relating to this group here so that it shows up on Google for those willing to do a minimal internet search before parting with their hard-earned money. Thanks for this and the other scams…i did the best i could with the information in ur post. Forwarded to my son who will be one of the prospective job seeker soon. Yeah and Barclays is always the first one on their list. Hope he is already aware and if not ur post will do the needful. At last! Someone who undesrantds! Thanks for posting! I wonder who offers a Laptop with 256MB RAM and a FLOPPY drive, leave alone Barclays in the UK. Haha… well said. Maybe it was top of the line in Nigeria a 15 years ago when this scam letter was first formatted? Very interesting post. Say thanks to your friend for sharing the letter with us. OMG this is scary indeed. Thank you for sharing your friend’s letter. Although if one reads it thoroughly the incorrect use of capital letters and inconsistent spacing within a sentence is glaringly obvious even if you ignore the awkward grammar bit. I just hope people desperately looking for jobs are attentive enough to notice them. Firstly, I must say, you have a very unique writing style and once I stumbled upon your blog, I just could not resist reading as many posts as possible. Thank you so much for sharing and being a part of the blogging community. Also, your posts are not just fun to read, but also, have a great impact on the whole of society. The internet is full of such scams and they use popular portals like naukri.com to harness job seekers database. They are now using company names like tata motors and honda cars india for their recruitment scams. Are you sure it is the right information? please reply. Thanks for the post man. Today I have dodged a bullet.